"Why Do Criminal Trials ‘Crack’? An Empirical Investigation of Late Guilty Pleas in Hong Kong"
Abstract: ‘Cracked trials’, where defendants enter a late guilty plea after a trial date has been set, are considered a societal problem because public resources set aside for trials are wasted. Various government reports attribute the main cause to tactical defendants playing the system, and reforms have been initiated to encourage early guilty pleas and strongly discourage late ones. 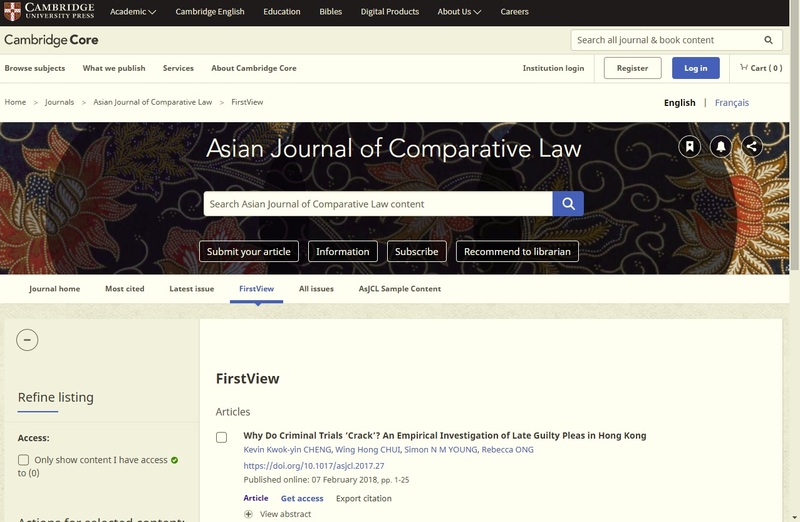 The aim of the present study is to investigate the reasons for cracked trials in the Hong Kong context, insofar as the reasons for late guilty pleas can be investigated without the influence of reforms seen in other jurisdictions used to discourage late pleas. A mixed methods approach of courtroom observations and interviews with defendants was adopted. We find that defendants who were represented by publicly-funded lawyers or who were in prolonged pre-trial detention were more disposed to changing their pleas. Subsequent interviews illustrate why these factors are salient. The findings support the notion that it is the pressures of the criminal justice process that lead defendants to ‘crack’ and highlight the costs to defendants for decisions on how to plead that are influenced by considerations other than actual culpability.